Conert launched a movement. Thirty-nine years later, benefit show by Joni Mitchell and James Taylor is released on CD. Vancouver's nightlife was hopping on Oct. 16, 1970. Liza Minelli was wrapping up a stint at the Cave. Stripper Sally Rand was doing her famous fan dance at Isy's. Funk Water was playing Lassiter's Den, Sweet Beaver was at Diamond Jim's, and Vancouver's Great Girl-i-Que Show (featuring "Daring Miss 007") was at the Smilin' Buddha. Tucked away at the bottom of the nightclub ads in the Vancouver Sun was a small blurb for a Greenpeace Benefit Concert. Tickets were $3 at the door, for a lineup that included Joni Mitchell, Chilliwack and Phil Ochs. Ten thousand people turned out, raising $18,000 after expenses. It was enough to send a protest ship to Amchitka Island, off Alaska, where the United States was conducting hydrogen bomb tests. And enough to launch the world's foremost environmental organization. The concert has been more or less forgotten over four decades. But not to the Stowe family, which had a tape of the concert. Every now and then, they'd haul it out to play for friends. A couple of years ago, Robert Stowe transferred the original reel-to-reel tape to CD as a Christmas present for his mother Dorothy and sister Barbara. The performances were so great, he thought they should be released. Greenpeace thought so, too. And so the world has Amchitka, the 1970 Concert That Launched Greenpeace, a double CD that is being released today. It's a wonderful CD, totally of its time yet timeless. Joni Mitchell is in top form, blending the rock and roll standard Bonie Maronie into Big Yellow Taxi. Phil Ochs is full of fire on his protest anthem I Ain't Marching Anymore. Unannounced guest James Taylor does a heartfelt version of Fire and Rain. One of the highlights of the CD is the introduction by the late Irving Stowe, one of the founders of Greenpeace. "Brothers and sisters in green peace," he announces. "Green peace is beautiful! And you are beautiful, because you are here tonight! You came here because you are not on a death trip! You believe in life, you believe in peace, and you want them now!" It's tres 60s, simultaneously kind of hilarious but quite moving -- a 55-year-old lawyer and Ban The Bomb activist announcing the birth of the environmental movement. His daughter was incredibly proud that night, but also admits she was a bit amazed. When her middle-aged dad announced he was going to throw a rock concert, she thought he was nuts. "We were selling Greenpeace buttons for 25 cents, and it wasn't raising a lot of money [to send a ship to Amchitka]," recounts Barbara Stowe. "Finally my dad said 'We'll have a rock concert.' Everyone thought he was insane. He said 'Fine. I'll organize it myself.' He wrote to Joan Baez. She couldn't come, but she sent a $1,000 donation, and gave him Joni's contact info. And she came on 100 percent." Mitchell also brought along James Taylor. 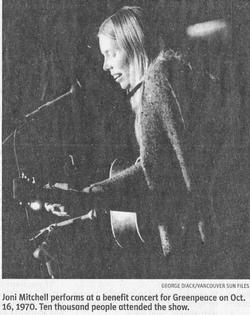 "She called us up one night at dinner and dad put his hand over the mouthpiece and said 'It's Joni! She wants to know if she can bring James Taylor, is that okay,'" laughs Stowe. "But we didn't know who James Taylor was. I actually thought he was a black blues singer, I had him confused with James Brown. My family was so out to lunch. But my dad said to Joni, 'Okay.' He hung up and said to us 'Don't tell anyone. We don't know who this James Taylor is. If he's no good, it could ruin the concert.'" The day before the show, Prime Minister Pierre Trudeau invoked the War Measures Act to deal with the FLQ crisis in Quebec. "All day we were worried the concert would be cancelled," recalls Stowe. "That added a real frisson to the atmosphere. It was quite electric. The radicals there were very, very emotional over that. Phil Ochs came to our house for dinner, and he was just outraged. He'd come up from the U.S. to peaceable Canada and here we were under martial law!" Onstage, Irving Stowe noticed a tape recorder was running. He approached soundman Dave Zeffertt of Kelly-Deyong, who said he taped all his shows. "Dad said 'We've got to tell the performers,'" says Barbara Stowe. "'But if they give you permission to keep that for personal use, I want a copy.' "
They did, Stowe got a duplicate and the results are now available for all the world to hear. Except for Mitchell's opening song Chelsea Morning, which she didn't like and edited out. Circle Game also cuts out halfway through, but Joni had nothing to do with it. "The tape ran out!" laughs Stowe. This article has been viewed 3,524 times since being added on November 11, 2009.